It should be a fun afternoon on Sunday in Baltimore as Connor Shaw steps off the practice squad to take over as starting quarterback for the Cleveland Browns. As we all know by now, Shaw will be the 22nd starting quarterback to take the field for the Browns since they returned in 1999. 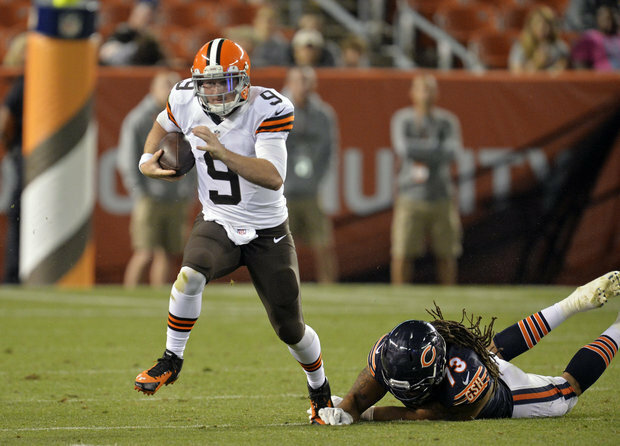 It also marks the third consecutive year, and fourth in the past five, that the Browns will trot out their third-string quarterback for the season finale. With any luck, Shaw will be more Jason Campbell (22-of-41 for 240 yards, one touchdown and one interception in 2013) or Thad Lewis (22-of-32 for 204 yards, one touchdown and one interception in 2012) than Bruce Gradkowski (five-of-16 for 18 yards and two interceptions in 2008) or Doug Pederson (13-of-30 for 75 yards in 2000). The only time anyone saw Shaw on the field this season came in the preseason, when he was eight-of-nine for 123 yards and a touchdown against Washington. In all honesty, starting Shaw over Johnny Manziel or Brian Hoyer probably doesn’t really impact the Browns chances, good or bad, of beating the Ravens. Manziel certainly wasn’t going to beat Baltimore, and with the way Hoyer played over the final month of the season, neither was he. And with Baltimore giving up just 87 yards per game on the ground, it’s going to be a long day for the offense no matter who is behind center. Especially after the news broke this afternoon that the Browns have suspended wide receiver Josh Gordon for Sunday’s game after he missed practice this morning. The suspension means that Gordon joins a growing list of players who may have played their final game in a Browns uniform. It also caps a year for Gordon that saw his 16-game suspension for being a repeat offender in the NFL’s drug abuse policy reduced to 10 games. Once he returned to the field Gordon did not resembled the impact player of 2013, finishing the year with just 24 receptions for 303 yards, no touchdowns, and numerous incorrect pass routes. The key part in all this, according to Albert Breer of the NFL Network, is that Gordon will not hit the six-game threshold this season to gain another year of NFL service time. Gordon will now not be eligible for free agency for another two years, which could potentially make him more a more attractive trade chip if the Browns decided to move on. “You’re starting an undrafted rookie quarterback – I don’t think we’re going to look to go down there and win one 41-38,” head coach Mike Pettine said in published reports. “We need to be along the lines of 3-2. The guys respect him because they’ve seen how hard he’s worked. It was good for him to get out there (and practice). Best case, Shaw plays well enough for the Browns to feel comfortable bringing him back next season in a back-up role (and we get months of people talking themselves into Shaw being “the answer” at quarterback). Worst case, Shaw plays like an undrafted rookie who has spent the entire season on the practice squad and the Browns lose their 12th consecutive December game. In other words, just another NFL Sunday for the guys in Orange and Brown.